Notes: Produced by Suzuki Toshio, written and directed by Miyazaki Hayao. This film received the 2003 Academy Award for Best Animated Film. While on their way to their new home in a country town, Chihiro and her parents get sidetracked and discover a mysterious tunnel that leads to what appears to be an old, but fabricated Japanese village. But this isn't an ordinary village at all - it adjoins a bathhouse for magical spirits – who are none too happy to find humans among them. Chihiro's parents fall under a spell, and Chihiro herself must work under the bathhouse's manager, an intimidating, greedy old witch named Yuubaba who binds her with a contract and steals her name, renaming her Sen. With the help of various otherworldly employees, including the young man Haku, she must find a way to undo the spell on her parents and return home to the human world before she loses her identity forever. You know you're watching a good Ghibli film when you forget that the movie is actually animated. Not content with providing us with his usual brilliant blend of imagination and down-to-earth fantasy a la Kiki's Delivery Service, Miyazaki pulls out all the stops in a surrealistic fantasy that may be one of the best movies we've seen in years. Or, in not so many words: it's excellent. Unlike Miyazaki's last movie, the excellent, but very message-heavy Princess Mononoke, Spirited Away sends us on a wild, weird journey through the world of Japanese folklore that is often humorous and whimsical, but still a bit frightening when seen through the eyes of a child who is far away from home. With a motley crew of characters that are larger than life (such as Yuubaba as a mutant Bette Davis, Kamaji as a half-spider/half-ZZ-Top-member boiler room foreman, and the grasping Floor Manager who is an outsized frog), Spirited Away entertains as it captivates, while Chihiro deals with almost impossible situations with her determination to save her parents, such as dealing single-handedly with a gigantic spirit covered in the modern world's pollution. But while the environmental themes often discussed in Miyazaki's movies do get the occasional nod, the overriding emphasis is the transformation of a person through their experiences. We get to watch Chihiro grow as a person in a way few movies can convincingly portray, and in this way, Chihiro belongs in the pantheon of Miyazaki characters as surely as Nausicaa and Kiki do. And while it draws from folklore as well as previous Ghibli work for much of its content, Spirited Away is still very much its own movie, with inventiveness and familiarity coalescing into something really, really fun. And, of course, Ghibli veterans will appreciate little touches like the reappearance of the dust balls from My Neighbor Totoro. As to be expected, the animation and music are excellent. While Japanese animation tends to put less emphasis on character movement than the almost obsessive detail of Western features, Spirited Away is a perfect example of how anime, and especially Studio Ghibli anime can portray worlds both real and surreal in a way few American cartoons ever attempt to approach. From the very first frame, the backgrounds give you the feeling that the Japan of this movie can't be anything but real and even the very surreal world of the bathhouse has a weight, a life to it that is simply lacking in the too-glossy, too-cartoony, too-unreal (though still very entertaining) worlds of Disney and Fox. For lack of a better term, Spirited Away is an intensely natural experience, in a way we find hard to describe. The seasoned anime fan will probably ask this: Where does it lie when compared to other Ghibli films? Well...does it matter? Of all the films by Studio Ghibli that we've reviewed, only Pom Poko fails to reach the pinnacle of our rating system. Each of us has our favorites, and Spirited Away doesn't reach for the depths of human emotion in the way that Grave of the Fireflies does, or come off as quite the labor of love Porco Rosso was. But Spirited Away is cute, entertaining, and masterfully made, and while the movie is unashamedly Japanese, it does not exclude foreigners from being able to appreciate the film, unlike the relentlessly ethnocentric Pom Poko, or even, to some extent, Princess Mononoke. You can add to all this a very competent English dub (directed by John Lasseter, who brought us the truly wonderful Toy Story and Toy Story 2). Purists will always complain about nitpicky details, but we found the dub to be appropriate for an American audience, especially one full of children that won't want to read liner notes to understand a film like this. Trust me, they won't need them. You don't have to be Japanese to like this film. You don't have to be a movie critic to like this film. You don't even have to be an anime fan, or to have seen all of Studio Ghibli's previous work. But Spirited Away impressed every THEM member who came to watch it, regardless of whether they were jaded anime fans or bright-eyed anime neophytes. We couldn't stop grinning afterwards. To quote a former THEM president, "Go see it. Bring your friends. Bring strangers off the street." It may not change your life, but for about two hours you'll forget where you are. 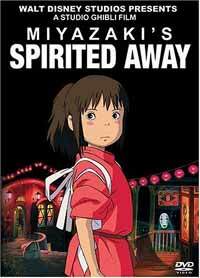 Talk about being spirited away. Recommended Audience: Despite some blood, supernatural violence, and somewhat creepy images, and large amounts of icky-looking stuff (this is a bathhouse we're talking about), we wouldn't say there's anything here that would make this movie inappropriate for anyone above the age of ten. And the first time we saw this movie (and we know we'll see it again), there were a few kids there who were younger than that, and they didn't seem to have any problem with it. The only people I see having a problem with this movie are those who are opposed to the concept of magic - and they probably wouldn't be watching Japanese animation anyway.